Backstage Class: A Tuning “Standard”? A discussion of system performance consistency. As audio mixers and engineers, we live in a world of standards. With the oversight of the Audio Engineering Society (AES) and many other vital and committed organizations, there’s a solid foundation of standards that help us make many of the decisions in our daily audio lives. When specifying a sound system for a show, we can look at a lot of information to help decide what type of design/approach is most suited for the venue, budget and application. These decisions are derived, in part, with the assumption that the information on loudspeaker coverage, power amplifier performance and other parameters is accurately reported by the manufacturers, allowing us to weigh the options based on the expected performance level of a system with those technical specs. But after the “right” system has been selected for an event, does the mix engineer who will be mixing on it have any guarantee that he/she can begin the day’s work from a neutral starting point? A sound company committed to quality and an experienced system tech will ensure the firmware and software is current, and that all of the components are functioning properly, before presenting the system to the mix engineer as a starting point. A scenario where this is very important is festivals. Many bands and engineers may be using the same system that day, and often there isn’t the opportunity to spend time “tuning” by listening to music, or sound checking before hopping behind the console. 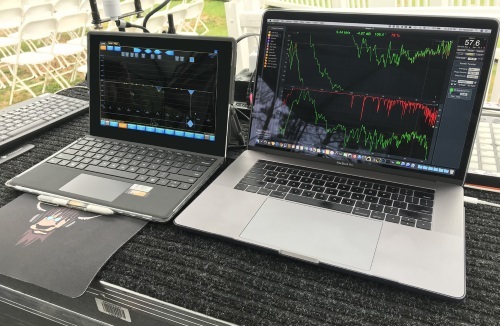 It’s becoming more and more common for engineers to bring their show files to load into the festival’s digital consoles, and the tonality differences between each mix can vary widely as each engineer’s “home” system may be tuned in a very different way. Wouldn’t it be great if mix engineers and system techs could agree (with a small degree of deviation) on what they’d like to see as a “standard tonality” for a system that has been optimized, tuned, and deemed ready? We all have our own unique approach, and I’m not suggesting that every system out there should be tuned in exactly the same fashion, but it’s a great topic that I’d like to encourage more dialog on. On many tours, the engineer and tech work together to achieve the results they’re seeking, with the band’s and/or manager’s approval being the final say. Some engineers with unorthodox gain structure and input channel treatment might choose to have the system tonally balanced much differently than another engineer who follows more traditional methods. But I believe this kind of “tuning the system to fit the mix” approach is best used in a touring setting, where the system is theirs to do as they please, and not necessarily for multi-act shows where several engineers have to work on the same system in one day. Whether they’ve brought their own show file along or are just going to “spin up a mix” from scratch, I believe there should be some level of expectation as to the tonality of the PA. However, what that “standard” tonality should be is the question. There are many different views on this topic, so let the discussion begin, but I believe the answer lies somewhere between what our ears tell us and what the transfer function reading tells us when the system is measured. Screenshot of Smaart v8 transfer function. 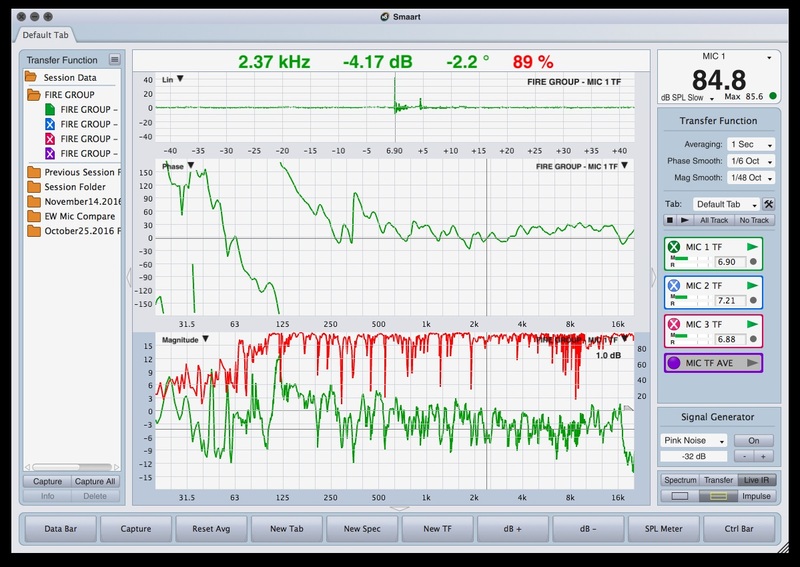 When we use one of the fine computer/software-based measurement tools available to us these days, such as Rational Acoustics Smaart and Meyer Sound SIM, the transfer function measurements that show the system’s frequency response are very useful. If the measurement system is set up correctly and utilized as instructed by a competent system tech with lots of experience, we can use the transfer function to compare the source material (music, pink noise) coming from the console to a reference microphone’s reading in the room. If we achieve a flat transfer function, the system’s response is relatively the same as what is coming out of the console. In essence, if the console mix sounds good, so should the PA.
A flat transfer function would be the “clinical proof” that the system is balanced from the lows up through mids and highs. Our ears would tell us if this is personally pleasing, and this would be then be the starting point to deliver our mixes. Jim Yakabuski has spent more than 35 years as a live sound engineer, working with artists such Van Halen, Journey, Avril Lavigne, Peter Frampton, and many others. He's also by author of "Professional Sound Reinforcement Techniques," which provides a collection of tips and techniques for mix engineers. It's available via Amazon.